I have several new lease listings coming on the market over the next week, and here is the first. Lying on a great cul-de-sac street in the coveted Beachwood Canyon area of the Hollywood Hills is this fine Victorian style home. House features soaring ceilings in the living/dining room area with tons of windows allowing natural light to flood the property and anchored by a stunning fireplace. The home has wood flooring throughout, an updated all stainless steel kitchen, and multiple outdoor patios. The property includes a good sized flat grassy yard in the front, along with a hot tub for relaxing. A ton of curb appeal in this one as well; simply a great home in a fine location. If you would like to see this home, please feel free to contact us anytime @ 310.600.9172 or email eric@smilayproperties.com. This is the third time I will be leasing out this great loft at the famed Broadway Loft Building in booming Hollywood, and on a recent showing I decided to break out the new camera and take some updated pictures. The main selling point besides the actual loft itself with it's 12' ceilings, designer furnishings, and open floor plan is the building. This is the premiere full service building in Hollywood with a ton of fine amenities, including 24 hour doormen, valet parking, designer lobby, gym, and most importantly sublime rooftop pool & spa with tremendous views. Just imagine lounging with your friends on the roof high above Hollywood just in time for Summer. If you are in town for awhile and/or wanting to test out the new Hollywood area before buying, this is a great place to do it, as it is being leased out fully furnished. If you would like to see this designer loft, please feel free to contact us anytime @ 310.600.9172 or email smilayproperties@gmail.com. THE premiere loft building at one of the most famous intersections in the world, Hollywood & Vine. Loft living at it's finest in this full service celebrity building in prime Hollywood. This chic fully furnished loft by noteworthy interior designer has soaring 12' ceilings, rich dark hardwood flooring, exposed ducting, and a designer bathroom. One of only a few units in the building that have a fire escape "balcony" off of loft as well. Building amenities include: sublime rooftop pool with 360 degree views, spa, gym, valet parking and 24-hour concierge service. Lobby & rooftop designed by famed designer Kelly Wearstler. Walk to the W, Katsuya is downstairs, and all that new Hollywood has to offer. Available June 1st. If you wish to see this designer loft, please feel free to contact us anytime @ 310.600.9172 or email smilayproperties@gmail.com. There was an article yesterday in the LA Times about another purchase of prime real estate in Hollywood, where the developer is planning a large mixed-use project. According to the times article, "Champion Real Estate Co. bought the paved 1.1-acre site behind the Hollywood Boulevard restaurant (Musso & Frank Grill) and between Cherokee and Las Palmas avenues from Common Fund. The price was not disclosed, but Hollywood real estate experts familiar with the property valued it at nearly $10 million." They are planning on creating a $50 Million dollar complex that would include residential, retail, and possibly a hotel. This is in addition to their purchase last year of a nearby Hollywood site that's over 2 acres. Among other ongoing development projects, there is currently a new mixed-use project being created on Sunset Blvd and Bronson by the mighty CIM Group, who has been at the forefront of the development in Hollywood with their groundbreaking Hollywood & Highland shopping complex. For those of you that don't have the ability to buy or develop an entire building, but would like to invest in the growth in Hollywood, which is surely going to continue to boom; I have a loft at Hollywood & Vine for sale. Get in on the action and grab a piece of the growth! If you would like to visit this uber chic loft in person, please feel free to contact us anytime @ 310.600.9172 or email eric@smilayproperties.com. Imagine a lifestyle where you move right into a furnished designer done loft in a secure doorman building at one of the most famous intersections in the world, Hollywood & Vine. You wake up in your hip designer done modern two story loft and go downstairs to your lower level, which houses your office work area - no sitting in traffic during your daily commute. At the end of the day you head back upstairs to get ready for a night on the town, and outside of the building you can walk a maximum of two blocks in either direction and you have top restaurants, shopping, and nightlife at your grasp within minutes. This saves you time, energy, gas money, and is just easier. Modern living at it's finest. Imagine that. With the evolution of Hollywood there is now a chance to live this urban NYC style lifestyle, but with the ideal climate of Los Angeles. In the past several years there has been a trend toward mixed use buildings, loft conversions, high end restaurants, and nightlife in Hollywood. For the right person looking to be among the action with the ability to walk everywhere, Hollywood & Vine is the epicenter. For me, I would much rather live here then downtown, especially considering the prices are already comparable if not even less in Hollywood. If this lifestyle appeals to you, this listing of mine may be just the right opportunity to own it. If you would like to discuss this area and it's recent growth further or visit this property in person, please feel free to contact us anytime @ 310.600.9172 or email eric@smilayproperties.com. I am not sure the pictures really do this one justice, but this is a large open space with soaring ceilings and would be an ideal live/work situation. In addition to the pics below, not shown is a super sized garage that can be used as an office space, photographer/artist studio, etc. The 10 unit building was built in 2002, so is newer, and features hardwood flooring, open beamed ceilings, and a ton of natural light from the multitude of windows. A large balcony up top showcases views looking back at Hollywood and of the Hollywood sign in the distance. The floor plan and space allow for several different options and configurations depending on one's needs. Please note, I believe that the 2,000 sq. ft listed on the listing does include the above mentioned garage space. If you would like to visit this property in person, please feel free to contact us anytime @ 310.600.9172 or email eric@smilayproperties.com. Smilay Properties is pleased to present our new listing at the Lofts @ Hollywood & Vine Building in Hollywood. In the heart of one of the most famous intersections in the world, Hollywood & Vine, is this designer done super chic two story loft. The NYC style loft at the heart of new Hollywood is being offered fully furnished, complete with custom and rare designer furniture, artwork, and wall coverings. The loft features soaring ceilings, a ton of windows flooding the property with natural light, and views of the landmark Capitol Records building and Hollywood sign. There is a bedroom/office area downstairs, and a bedroom area and open living/dining room/kitchen upstairs. A great mix of raw space in this recently converted 1929 building & high end modern finishes like the all Viking kitchen and Ann Sacks tiles in the bathrooms. Booming location, walk to the W Hotel, Katsuya, Pantages Theater, and much more. Note, HOA dues include all basic utilities & doorman. In short, this one is special! Nothing to be done on this one, can just move right in. The design and furniture is amazing and really gives the loft a wow factor. This is a rare resale in a great building with a cool lobby and rooftop deck overlooking all of the city. If you would like to visit this property in person, please feel free to contact us anytime @ 310.600.9172 or email eric@smilayproperties.com. My new listing at the corner of Hollywood & Vine is at the epicenter of Hollywood's resurgence. With literally Billions of dollars invested into the area in the last decade, Hollywood is now returning back to it's roots as the glamour capital it was in the 1920's. Visit SBE Media's page and click on the link with the logo of KNX1070 (like below) and hear SBE CEO Sam Nazarian discuss the area's resurgence. See why his company is so high on the area. My listing is a chance to own a piece of that development, and live in what continues to be a great live/work epicenter of Los Angeles. See a detailed tour of the loft for sale HERE. If you would like to visit this property in person, please feel free to contact us anytime @ 310.600.9172 or email eric@smilayproperties.com. In the heart of one of the most famous intersections in the world, Hollywood & Vine, is this chic two story loft. The NYC style loft at the heart of new Hollywood features soaring ceilings, a ton of windows flooding the property with natural light, and views of the landmark Capitol Records building and Hollywood sign. There is a bedroom/office area downstairs, and a bedroom area and open living/dining room/kitchen upstairs. A great mix of raw space in this recently converted 1929 building & high end modern finishes like the all Viking kitchen and Ann Sacks tiles in the bathrooms. Shows like a "model loft" and can be purchased fully furnished, complete with custom and designer furniture, artwork, and wall coverings for $650,000. Booming location, walk to the W Hotel, Katsuya, Pantages Theater,& much more. Note, HOA dues include all basic utilities & doorman. Washer/dryer hookups in unit. Great for investors also as can lease for a high monthly rate in a rapidly growing location. Here is a nice looking new listing to start the year off right. Featuring an open floor plan with soaring open beamed ceilings and walls of glass, this is a stylish mid-century home in a popular area of the Hollywood Hills, Nichols Canyon. The walls of glass frame the living/dining room nicely and flood it with natural light, as well as lead out to a large deck that runs the length of the home and exposes relaxing canyon views. There is rich wood flooring throughout most of the property, and a modern updated kitchen with all stainless steel appliances. The home has two good sized bedrooms, both with high ceilings as well, and two upgraded bathrooms. There is also an additional front deck, which allows for further outdoor entertaining. This home looks good for the price in a desirable location, close to everything that Hollywood has to offer. If you would like to visit this property in person, please feel free to contact us anytime @ 310.600.9172 or email smilayproperties@gmail.com. If you would like to see other similar homes in and around this location as well, please don't hesitate to call, as we would be happy to assist. Check out this new listing to hit the market in the Hollywood Hills. The gated home was recently remodeled with polished concrete flooring, updated baths, a gourmet kitchen, and a nice water feature in the entryway. I am a big fan of concrete flooring, as it looks sleek and is easy to maintain, especially if it comes with radiant heat, which this one does. The open floor plan with large floor to ceiling windows allow natural light to flood the property and create a great indoor/outdoor flow. There are three good sized bedrooms and three full bathrooms. The outdoor space is a great place to relax on the weekends or entertain your friend's and family. A good location within minutes of the heart of all that new Hollywood has to offer. Make sure to check out the marketing video after the break. I have to give the listing agent his just due on this one, as it is nicely done, and gives a sense of the "lifestyle" one could have, should they want it, if they lived there. Well done Sir. $969,000 3 Bed 3 Bath 1,732 Sq. Ft. 5,000 Lot Sq. Ft. This is another nicely remodeled mid-century home in the Hills that is sure to draw a lot of attention. If you would like to see this stylish home in person, please contact us anytime @ 310.600.9172 or email smilayproperties@gmail.com. We just closed escrow today on this short sale condo in the Cahuenga Tennis Club condominiums. This is a building located in the Hollywood Hills, and is loaded with amenities and finely manicured grounds. Having made their offer back in April, the Buyer had to be and was patient while waiting for the bank's approval on the price. It was wise for her to hang in there, as she got a great deal. I think there are plans to do some remodeling and make it shine. I wish the new owner the best. If interested in finding a similar opportunity please feel free to contact us anytime @ 310.600.9172 or email smilayproperties@gmail.com. Having previously leased this unit, the current Tenant will be moving out soon, so the property will be available again August 15th. 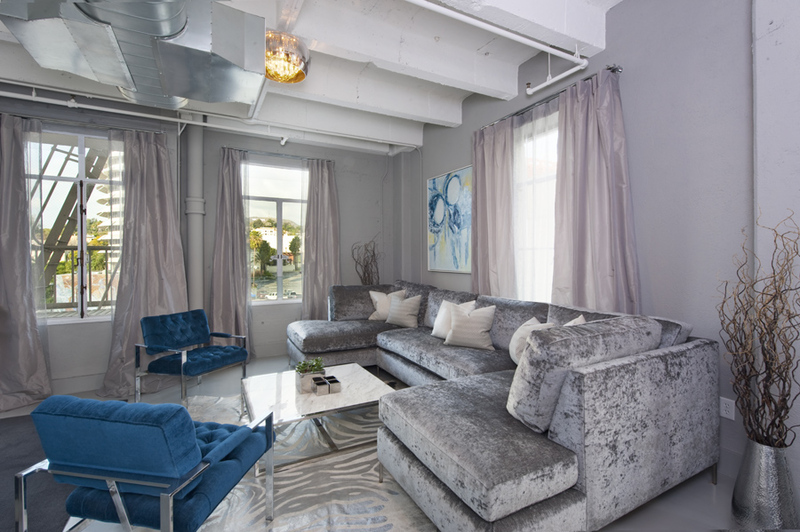 This is a designer NYC style loft in the most desirable loft building in Hollywood, filled with celebrities and VIP's. Here is a great opportunity to live in the center of Hollywood's growth on the world famous intersection of Hollywood & Vine. The fully furnished loft designed by noteworthy east coast designer comes fully stocked with everything, including a large approximately 50" flat screen TV. There are not a ton of lofts in Hollywood, and this is widely considered the best building, so this is an opportunity not to be missed. The full service building and it's amenities, including valet parking, gym, concierge, ability to order from Katsuya downstairs, and stunning rooftop pool and lounge are unmatched in the city. $3,850/mo Fully Furnished w/ Designer Furnishings 1 Bed 1 Bath 1,000 Sq. Ft.
See more pictures of the loft and the building, and a video here. If you would like to see this property in person, please contact us anytime @ 310.600.9172 or email smilayproperties@gmail.com. Here is a great condo alternative in a fantastic neighborhood just off famed Sunset Plaza Dr in the Hollywood Hills above the Sunset Strip. The main space has open beamed ceilings to complement the open floor plan with an updated kitchen, all looking out to stunning views of the city below. Not large by any means, but with it's two bedrooms and two baths, decks, in ground spa, and incredible city views, this updated mid-century home's hip style will surely be attractive to a lot of buyers. The listing states that at night the home is even better by saying, "This house must be seen at dusk and evening when the twinkle of city lights and the quiet of this cul-de-sac street make all forget this is L.A." All in all, a stylish house in a great location with views. Off of Laurel Canyon in the hills above Sunset is this modern architectural redo with clean lines and designer finishes. The home is uber sleek with an open floor plan, nice wood flooring, a sleek updated kitchen with carrera marble countertops and top of the line appliances. The chic fireplace with built in flat screen and book ends anchor the stunning open living area. The master bedroom is huge with high ceilings, a sitting area, and luxurious master bath with Phillipe Starck fixtures. Walls of glass throughout the house lead out to an outdoor cabana area, garden, and nice canyon views. In the Wonderland school district with easy access to Hollywood, the Westside, or the Valley, this could be a nice property for the modern enthusiast. If you would like to see this home in person, please contact us anytime @ 310.600.9172 or email smilayproperties@gmail.com. Two redone mid-century homes in the Hollywood Hills above the Sunset Strip with superb finishes were listed this week. They both are almost identically priced, and offer a ton of home in prime locations. The first one is high up Nichols Canyon on Devista, and is a bit more stark and modern with it's white flooring than it's selling competitor. The other is up famed Sunset Plaza Dr and lies on Rising Glen; it is definitely modern and updated, but retains a more warm "homey" feel. They both have nice pools and city views. See the rest of the first listing and the second home after the break. Which one do you like better? Please comment and let me know as I am interested in hearing your thoughts. Two really nice looking listings that are beyond move in ready and nicely merge style and function. Which one do you like better based on the pictures? If you would like to see either or both of these properties in person, please contact us anytime @ 310.600.9172 or email smilayproperties@gmail.com. This is my listing, and we were one week away from getting bank approval on this short sale when unfortunately the buyer walked. This often happens on short sales, as the process can take two to three month's, sometimes more. That said, the benefit of waiting around is that one can get a deal. The sellers paid over $430,000 for this property, as it has a nice open floor plan, and lies in a resort like community with a lot of great amenities in a nice Hollywood Hills location. Great opportunity awaits a savvy buyer, who wants to get in on the more than $2 Billion worth of development recently done in Hollywood. Popular gated community with multiple pools and tennis courts. Nice condo with modern open floor plan and beds on opposite sides of the unit (good for roommate situations). Laminate wood flooring throughout with black granite breakfast bar in kitchen. Large balcony leading out to peaceful treetop views adding to the experience. Short Sale, take advantage, all offers welcomed. It does need some updating, but at this price in this location, you win! If interested in seeing this condo opportunity in person please feel free to contact us anytime @ 310.600.9172 or email smilayproperties@gmail.com. Originally a 1920 Spanish house that the owner has masterfully transformed into a hip modern architectural house in the highly desirable Beachwood Canyon area. Wide open lofty floor plan with 9' ceilings throughout most of the property. Property has great indoor/outdoor flow with several large windows opening up to the outside throughout the property for true California living. Nice wood flooring throughout, upgraded kitchen and designer baths. Huge master suite with office area off of the room and balcony overlooking peaceful canyon views. Master bath is currently being remodeled with top of the line finishes, such as Axor by Phillipe Starck Hansgroghe fixturing and stunning Ann Sacks tiles. Also a roof top deck, & peaceful zen front sitting area. Remodeled very nicely with great deatails like, deconstructed ceiling and exposed concrete blocks, by contractor owner. Available April 1st. A great lease opportunity on a very cool house in a great Hollywood Hills location. At the end of a cul de sac on a private street, the home is quite peaceful. If you wish to see this property, please feel free to contact us anytime @ 310.600.9172 or email smilayproperties@gmail.com. A Tour De Force at the top of exclusive Sunset Plaza Dr has just been listed this week. It is gated, private, and on a half acre lot with views of all of Los Angeles below stretching all the way out to the ocean! Built in 1994, the house lies on a spectacular piece of property without question. The house itself is a bit industrial for my tastes with exposed concrete walls, flooring, and stainless steel kitchen counters. That said the amenities are fantastic including; large pool, sauna, full gym, a recording studio, and even what every Hollywood resident needs in their house, a nightclub. Definitely a one of a kind offering in a prime location. It looks like the owner paid $8,000,000 for the property at the end of 2008, not sure if they did any upgrading to justify the $4M increase, so may be some negotiating room in there. If interested in seeing this one of a kind property and being the "King of the hill," please feel free to contact us anytime @ 310.600.9172 or email smilayproperties@gmail.com. Back on the market & Reduced. Attention Developers, Contractors, Investors, & Professional Flippers this is a tremendous opportunity that just needs work and updating. Fix up and add value to live in or sell -- so much potential here. If done right, I believe this house would sell in the $1M-$1.1M range, so there is a deal to be had here for a savvy investor. Lying in a great location in the Hollywood Hills is this Spanish home with intricate character details throughout. Up in the hills with peaceful canyon views and on a great street, but just a minute to the heart of either Hollywood or Studio City. Great curb appeal; upon entry one is struck by the multiple large bay windows allowing a ton of natural light to flood the property. There is also an addt'l 1 bedroom apartment space with it's own separate entrance. Also a six car parking garage! Simply a great opportunity in a prime location. Motivated seller. Please visit http://gallery.me.com/bartondt#100020 for a detailed tour of the professional pictures taken of this fine property. This is a large home that is priced well in this location. It has exquisite Spanish details, an open floor plan, updated kitchens and baths, and is ready to go. If you would like to see this home, please contact us anytime @ 310.600.9172 or email smilayproperties@gmail.com.